Spurs host Juventus at Wembley in the second leg of the Champions League round of 16 tie on Wednesday night. The first leg in Turin ended 2-2. Don't miss our Spurs vs Juve betting preview with predictions, betting tips, starting lineups, team news, highest odds, exclusive betting offers and no deposit free bets on this week's matches! Tottenham have gone 17 matches unbeaten in all competitions and are in the hunt for trophies and a top four finish this season. They sit 4th in the Premier League standings, 2 points below Chelsea, and have secured their route through to an FA Cup quarter final with Swansea by beating League One strugglers Rochdale in an FA Cup replay last week. Spurs enter this match on the back of a routine 2-0 victory over Huddersfield at the weekend. Pochettino's men hold a slender advantage after the first leg having battled from 2-0 down to draw 2-2. They are unbeaten in the Champions League this season, winning five of their seven matches while drawing two. Tottenham will be without Toby Alderweireld due to a hamstring injury but Jan Vertonghen is fully fit. Serge Aurier is suspended for Spurs, so Kieran Trippier is likely to deputise at right-back. In midfield, Mousa Dembelè and Eric Diet should feature from the off, with Harry Winks and Victor Wanyam viable alternatives After his brace last time out, Heung-min Son is expected to retain his place on the right, though Erik Lamela and Lucas Moura are pushing for a start. The South Korean should join Dele Alli and Christian Eriksen in the offensive midfield, behind the lone striker Harry Kane. Gonzalo Higuain is a doubt for the game while Paulo Dybala looked 100% recovered. Dybala is expected to start as false nine, flanked by Mario Mandzukic and Douglas Costa in a 4-3-3 system. The likes of Blaise Matuidi, Miralem Pjanic and Sami Khedira will start in the middle of the park. Giorgio Chiellini and Mehdi Benatia will play at centre back, with Alex Sandro and Stephan Lichtsteiner as full backs, and legendary goalkeeper Gianluigi Buffon between the posts. Juan Cuadrado, Fernando Bernadeschi and Mattia De Sciglio are all out. BetAndSkill team always strive to find the best odds on every match we analyse. Check below the best available odds on the Spurs vs Juventus match winner market (90 minutes only)! We also invite you to take a loot at our enhanced odds section and back your favourite team at higher prices! Read below our free picks on Spurs vs Juventus, selected by our football expert. Join our betting community and bash the bookies with us! Please, come back to leave a comment at the bottom of this page should you win your bets! Looking for more betting preview on this week's Champions League fixtures? Go to our Champions League predictions section! Don't miss our free predictions anymore, follow us on Twitter! 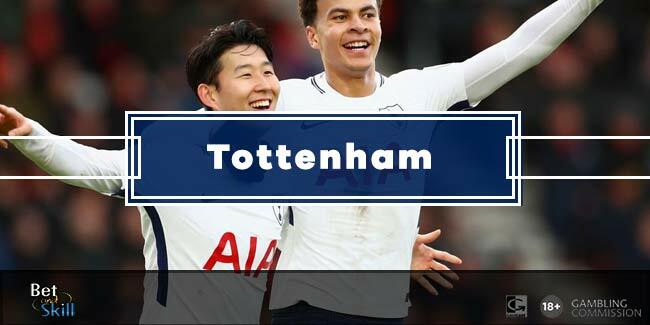 "Tottenham vs Juventus predictions, betting tips, lineups and free bets (Champions League - 2nd leg - 7.3.2018)"